Tease Against A Lightweight, Or Something More? In a crazy way, Sunday’s decisive victory against the 49ers was incredibly frustrating for Buc fans. It showcased what might have been in 2018 if this team had shown more discipline about keeping the football and retrieving the football. For one glorious afternoon, the kicks were straight and the numbers were crooked as Tampa Bay ended a 4-game skid in dominant fashion. The schedule hardens as the Panthers and Saints come marching into Raymond James Stadium in the next two weeks, but make no mistake — the Bucs would have beaten a lot of clubs Sunday with the way they played. According to the NFL standings, the Bucs are a last-place team in the NFC South at 4-7. And despite outgaining opponents by an average of 63 yards per game, Tampa Bay has been outscored by 44 points. The Bucs still lead the NFL in total offense and rank No. 2 to the Colts in third-down conversion rate at 50 percent. Mike Evans has already topped 1,000 yards and DeSean Jackson is on pace for almost 1,100. The story of this Buc season will be written in red ink, representing all the blood spilled with self-inflicted wounds. Lousy defense and too many giveaways have trumped all those yards through 11 games. It turns out Todd Monken was quite the prophet back in training camp when he said the Bucs would thrive if they can generate explosive plays while maintaining ball security. That’s a neat trick, and one Tampa Bay hasn’t mastered for most of the season. Explosive plays? Check. Ball security? Checkmate. Before looking at the film, 49ers coach Kyle Shanahan admitted his quarterback didn’t play particularly well. Nick Mullens looked like a backup, but the Bucs contributed to his struggles with a fierce pass rush led by Jason Pierre-Paul and high-motor left end Carl Nassib. On the other sideline, Jameis Winston turned in a clean sheet that should generate some swagger before the reeling Panthers hit town. This organization doesn’t want to start all over with another quarterback … that’s unsettling. The Bucs will do it if they have to, but Winston just took a major step in securing his place on the 2019 roster. Was Sunday’s game a harbinger of good things to come, or just a tease against a league lightweight? The next two weeks will provide the answers. 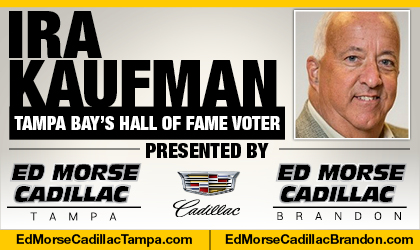 Now in his 40th year covering the NFL, Ira Kaufman is the most revered sports personality and writer in the Tampa Bay area. 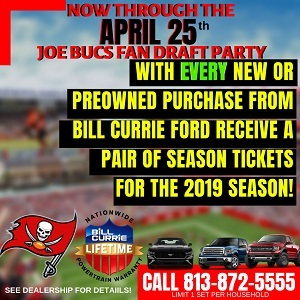 He scored a full-time seat at JoeBucsFan.com world headquarters in July of 2016, and Tampa Bay’s only Pro Football Hall of Fame voter busts out columns here every Monday, Wednesday and Friday. His award-winning podcasts fire Tuesdays and Thursdays. You can also hear Ira on SiriusXM Mad Dog Radio Wednesdays at 5 p.m. Also a TV star, Ira is part of the FOX-13 Tailgate Sunday NFL show at 10:30 a.m. “The Sage” enjoys beet salads, Riesling, tennis, Bette Midler, Chiefs victories and needling Joe. …Don’t forget to WATCH IRA AND DERRICK BROOKS on the new TAMPA TWO show from The Identity Tampa Bay and JoeBucsFan. This org may not have a choice. If I’m Winston’s agent I’m getting him out of TAMPA and into NY ASAP. I’d even take a measly 20 mil to play in NY, anything to get out of here. Let you guys ride with Fitzmagic since you guys love him and DivaJax so much. Good points. An NFL win is never easy. The Bucs should have more of them. This is the best 4-7 team I’ve ever seen. I’m a huge Jameis supporter and the Jameis I tout showed up yesterday. Hopefully we see this and a better version of Jameis in the years to come. Nothing like a win and a punch to the gut for all the Jameis Bashers. Jamie’s will be starter next year…no matter what he does. He should be, no need to long term him until next year…you can decide. no risk keeping him. new QB will produce worse results. we don’t need to let go another Williams or Young. Considering they were playing one of the worst teams in the NFL, there is no proof they have improved. Next week against the Panther will be a better gauge. This is what happens with a bad coach and a bad franchise. The season was set up perfectly. Start 2-1 against anyone highest hopes and then you could enter into winnable games. But a weak coach and a weak franchise blew up their plan. Jameis should have started the Chicago game to get the kinks out and by the Bengals game he would have been right. I have never seen a worst coach with worst instincts. You mean the best team you’ve seen with a 32nd ranked D? Two suspect QB’s, No running game, years of bad drafting/FA’s, and a Div II college coaching staff? I’d even take a measly 20 mil to play in NY, anything to get out of here. Does that mean you’re moving to NY? They should have let Fitz suffer on through the CHI game..No point in making Jameis mop up. On only two days of practice. I said this in another post, but we need to keep him. There are far too many problems on the other positions that need help. The Bucs are a shell of a team clinging to a potent offense that seemingly performs well at random. Throw Jameis overboard, might as well do the same with Lavonte and Gmacs playoff hopes in Tampa. Jameis is playing for his career. The team has to hope he succeeds, there are too many holes to fill. 2 big things yesterday. Vea stepped up big time, allowing the defense to control the line for the first time in a while. If Vea can do it consistently, the Bucs will get pressure. The other thing is you had players making plays who’ve never made them before. Huge dose of confidence. But, I still think there are too many injuries on defense to make a good run. If Jameis can take this controlled cerebral approach the rest of the way we may be able to surprise a few of these teams left in the schedule…. As much as I’ve ridden Vea, he had a monster game yesterday. He was blowing up plays left and right, driving guys into the backfield, closing the cut back lanes. Not allowing the QB to step up in the pocket. And not just getting into the backfield, but making plays. Losing four yards on a run after the defensive tackle blows your line back five yards is kind of demoralizing. If he can get consistent at this level, he will be a huge force. But the jury is still out on that one. San Francisco is on pace to pick first in the 2019. They are on their 3rd string QB that nobody has heard of until now. Jameis played well…which is encouraging. I would love to see them knock off the division rivals as well as Dallas. Color me dubious until they win a few more. DB55- It’s statements like that that make me shake my head! It’s not like he’s been playing like this all along. Over 4 years we have lived through the ups and downs and now you’re saying WE don’t deserve HIM. No DB55, the FANS deserve better! Better than 4-7, better than 1 winning season out of 3, better than DEAD LAST in turnover differential, and lastly better than a player who finds himself suspended for the first 3 games of a season. Or are you going to be hypocritical about HIS suspension? FANS deserve winning! If it ain’t about THAT it ain’t about nothing. Give me a break! Fans don’t deserve him!?! Man, please! You deserve better, now your challenge is to find a better QBs. Should be very easy based on the comments this town has offered up since last March. It was a 2-8 west coast team playing a 1pm east coast game. A gift you could say. I doubt the bucs have figured out yet how to stop a misdirection run so they’ll get clobbered again this week. Not many more gifts on the schedule. N Dirk isnt outcoaching anyone. Doubt theyll win again. Lose em all baby lets prepare for the future! DB55- C’mon dude! What are you saying?! Based on past performance, this guy is a legit “franchise QB?” The only thing Jameis has shown besides heart is that he is consistently IN-CONSISTENT. I owe him nothing, you owe him nothing, WE owe him nothing. Let him string a couple more (FIVE) games like he did yesterday and he will endear himself to those that want winning, not a name on the back of a jersey, WINNING! If he can’t, oh well. We saw what others can do. The 49ers looked like the worst team in the NFL. I’m sure they would have looked different with Garapolo starting but I’m not sure how good they would be. Their wide receiver group is not a top tier group. As an aside, I saw a lot of 49er gear at the stadium but I don’t think I saw one Colin Kaepernick jersey. I’m saying if I were Winston’s agent I’d find a new job for him. TAMPA deserves better and based on their track record They should have no issues finding a QB who wins. That’s all no hard feelings. To me – it is very much about the defense. Despite having a literal bunch of no names + Grimes covering the back 7 – the Bucs Defense played its best game of the year yesterday. Because the DLine stepped up and played with all out effort. Its what we expected to see from the beginning this year with all the high dollar hired guns and #12 overall pick “firepower” that Jason Licht brought in up front to go along with #93. But until yesterday – all those pieces had yet to play well as a unit – despite more than solid play from JPP the majority of the year. Yesterday the DLine balled out. And the back 7 full of rookies, udfas and special teams players looked competent. And also for the first time all season – the Bucs played a complete game yesterday. Complementary football. Both sides of the ball doing their jobs well. Not perfectly but consistently well. Special teams played solid. The kickers were both perfect in their execution (as they should be most weeks). There was no rash of boneheaded penalties at just the wrong time – or at any point. The offense played solid, turnover free football and scored more than enough to beat a bad team. Lets enjoy this one. because..The Panthers are comin to town..Pissed. They will NOT play like the 49ers did. And The Saints are..chopin at the bit to pay us back..and they will. Winston really doesn’t have much of a choice where he plays the next 3 years in reality. At this point in the season wins and losses don’t matter. What matters is can Winston and the young players all take steps to be better for 2019 and beyond. If JW feels like DB55 and believes he should be playing somewhere else…ship him out. DJAX obviously feels that way…ship him out. Rule #1 I do not want players on my team who don’t even want to be on the freaking team. I disagree with DB55. JW is already wealthy for life…20 million is irrelevant…he’s ALREADY worth that and he’s set to double his net worth no matter where he plays. I do not believe JW wants out. JW has had success his entire athletic life. This Buc experience is his first failure ever in football. He may have had bad games at FSU…rarely… but so far his Buc career has been an abomination on and OFF the field. I think JW has pride. He doesn’t whine like DB55 and complain…largely because unlike DB55 JW realizes his OWN role in his failure. I admit it might just be hope but I feel like JW is ready to grow up and he wants to leave Tampa a success…not as the loser he would be if he leaves after this year. Put yourself in JW’s shoes. Money is not the issue..WINNING however is a JW obsession. So he looks at this team…his targets…his improving OL…Barber’s decent play…the way the DL played yesterday and he asks himself can he or any QB win with this team in 2019? I think he would say YES!!! I’m still believing JW hasn’t given up.